In response to the current Zika virus outbreak, we would like to provide you with the following information. Scientists at the Centers for Disease Control and Prevention (CDC) have concluded, after careful review of existing evidence, that Zika virus is a cause of microcephaly and other severe fetal brain defects. In the report published in the New England Journal of Medicine, the CDC authors describe a rigorous weighing of evidence using established scientific criteria. At this time, CDC is not changing its current guidance as a result of this finding. Pregnant women should continue to avoid travel to areas where Zika is spreading. 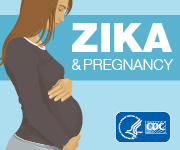 If a pregnant woman travels to or lives in an area with Zika, she should talk with her healthcare provider and strictly follow steps to prevent mosquito bites and to prevent sexual transmission of Zika virus. We also continue to encourage women and their partners in areas with Zika to engage in pregnancy planning and counseling with their health care providers so that they know the risks and the ways to mitigate them. All archived materials are now available for the COCA Call held on April 12, including the webinar recording, slides, audio recording, and transcript. A low proportion of persons who had testing for Zika virus in the United States had confirmed Zika virus infection. Approximately 99% of asymptomatic pregnant women who were tested had no laboratory evidence of Zika virus infection. Given the potential for adverse pregnancy and infant outcomes associated with Zika virus, health care providers can continue to offer Zika virus testing to asymptomatic pregnant women with potential exposure. However, these data suggest that in the current U.S. setting, the likelihood of Zika virus infection among asymptomatic persons is low.